FLORAL & GRAPE Water Sets, (Banded Left-Leaning Lines) : A realistic point of fact is this: Right and left-handed individuals handle items/tasks in a differing manner. “Perhaps” the mould-maker for this Floral & Grape design was left-handed? 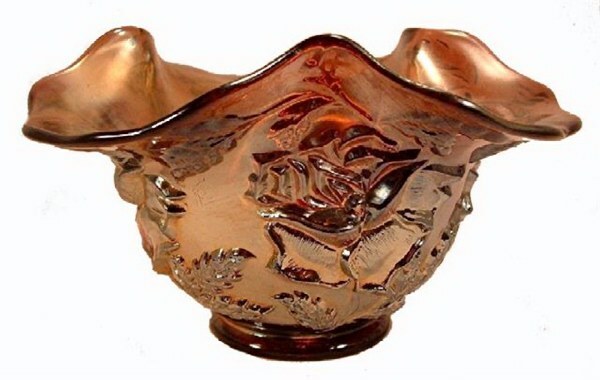 Very likely, he would have held the tools in opposite position from the right-handed mould-maker who created the right-leaning lines seen on Fenton Floral and Grape. The top/bottom bands further emphasized that difference in the diagonal lines! April 1912 Butler Bros. Catalog - Dugan - (bands). Dugan - (bands) 1919 last year of ads. 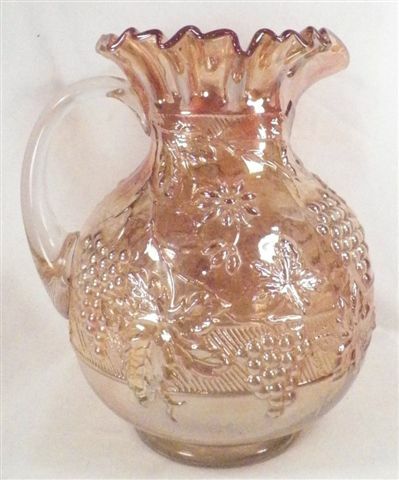 FLORAL and GRAPE Pitcher & Tumbler.(bands). 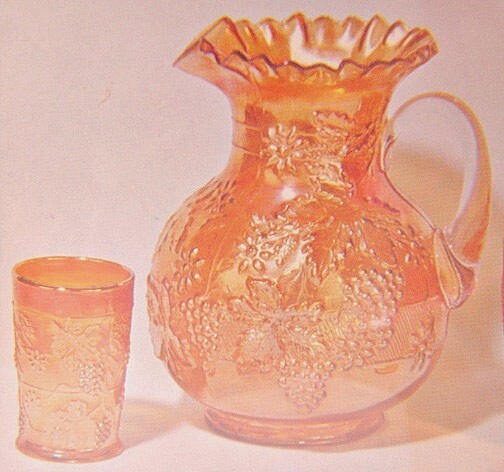 FLORAL and GRAPE Pitcher & Fenton Tumbler.(bands). White - 4 inches tall.(bands). 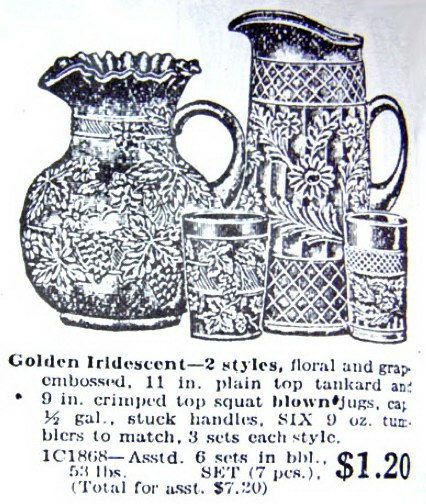 In a 1911 photograph shown on page 81 of the Heacock book, a waterset in the Floral & Grape pattern is shown with this notation: Two different molds were used on the Floral & Grape pitcher. The one shown here has ten petals on the daisy closest to the handle and the ribs lean to the right. The three examples photographed in this book (Figs. 138, 162, 172) have eight-petaled flowers and the ribs lean to the left. Note Bands across left-leaning lines. FLORAL & GRAPE - Marigold. The Helman diggings (during 1975 and 1976). on the former grounds of the Dugan-Diamond dump site in Indiana, PA divulged parts of this pattern, declaring finally, that there is a version of the pattern from both Fenton and Dugan/Diamond production. The pattern continued into 1919. Water pitchers are found in marigold, amethyst, cobalt blue, white, lime green w/marigold overlay. Tumblers are known in marigold, amethyst, cobalt, blue and white. Somebody ruffled some tumblers into hat shapes in marigold and amethyst. ADAM'S RIB Fan Vase in Marigold - 6.5 in. tall. ADAM’S RIB Vase: This pattern is the first of the iridescent lines produced by Diamond which bridges the span between carnival glass and stretch glass. Not introduced until 1925, it had been marketed as Diamond’s #900 line. 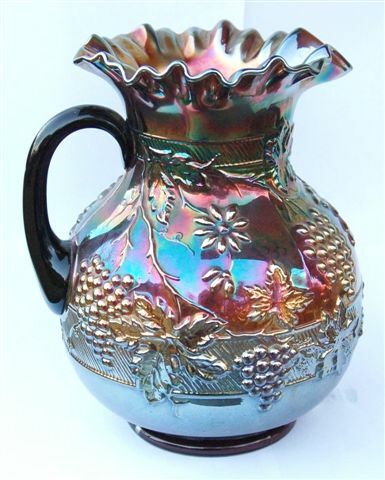 In addition to this Fan Vase, there are candlesticks, covered candy jar, open sugar, pitcher, mug, compote, footed console and a large bowl having this brilliant iridescent luster found on stretch glass. The lined effect in the pattern adds interest to the overall desirable attributes. These fan vases are found in marigold, ice green, and celeste blue. WREATH OF ROSES Tri-Corner in Amethyst. WREATH of ROSES Whimsey: Rosebowls and the tri-shaped whimsey bowls are found in marigold and amethyst. 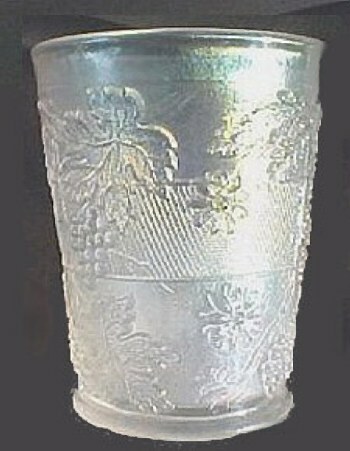 (An occasional aqua, lime green/vaseline base glass example, or perhaps one with an amber tone added to the iridescence is found.) 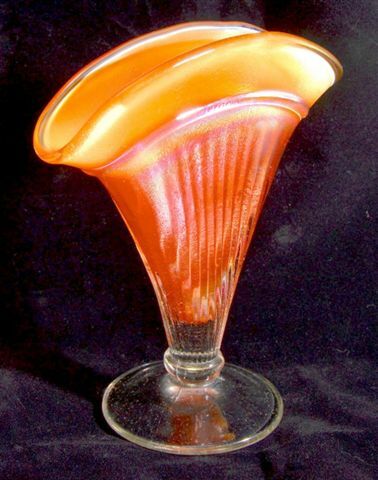 A spittoon shape in marigold is known, as well. The design is from the Dugan-Diamond era. HOLLY & BERRY Nappy in Peach Opalescent & Marigold Gravy Boat. HOLLY & BERRY Gravy Boat: This Dugan design dates from 1909-1913.The size: 6”-7 ½” is found in ruffled bowls (some having the nappy-type handle), while others are found in this gravy boat style. Handled nappies are known in marigold, amethyst, peach opalescent and cobalt blue. Few of either the bowls or nappies are seen, as compared with many other Dugan patterns. Marigold examples in either shape are seen less often than amethyst and peach opalescent. 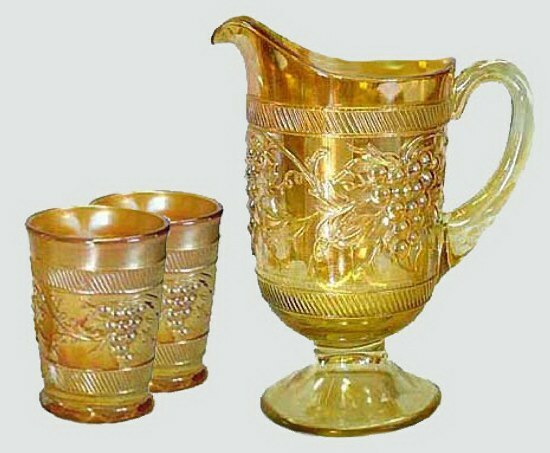 Vintage Banded water set in Marigold. 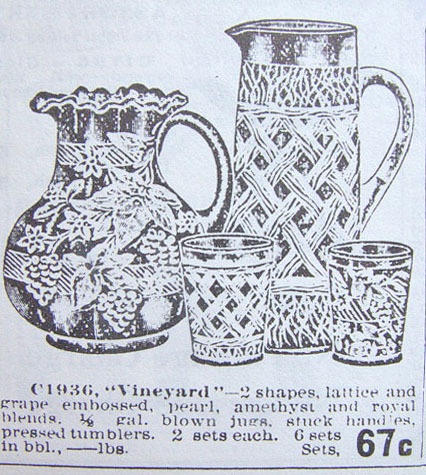 VINTAGE BANDED Water Set: This design did not appear in wholesale catalogs until 1922, extending through 1930; clearly placing the pattern within the Diamond era. Although marigold mugs in this pattern are rather plentiful, only one amethyst example has been verified. The water set is a very different story. The pitcher is one of only a few in all of carnival, having the pedestal base. With such a lengthy production period, it is curious that there are more known pitchers than tumblers in marigold! 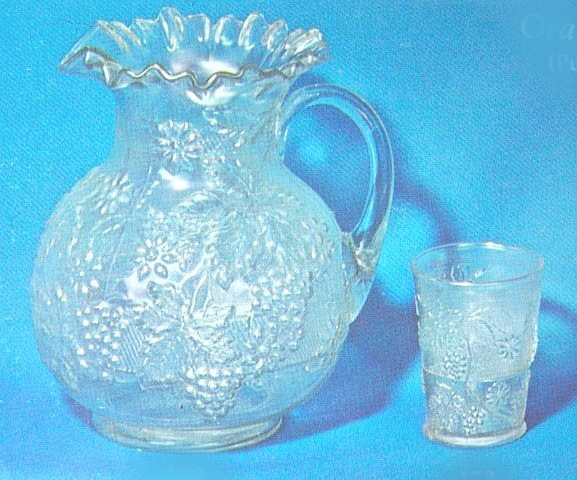 The water pitcher was reported in amethyst (no tumblers), when Carl Burns wrote his 1999 book on Dugan-Diamond carnival. As of December 2013, none have been reported as sold in auctions listed on the Doty site. Windflower Nappies in Amethyst and Marigold. Still in production when pastel green iridescent items were introduced in 1921. Three shapes within the pattern are found. 7 ½”-9” bowls in marigold are easily found. Amethyst and cobalt blue examples require a bit more patience. Most of the bowls are ruffled, with a few ice cream shapes found. The 8”-9” flat plates are seen much less often. Marigold plates are more available than amethyst and very few cobalt blue plates are known! The only other shape known in the pattern is the single-handled nappy. They are spade-shaped and found in a wider array of colors than the other shapes within the pattern. Not particularly “plentiful”, but somewhat available: marigold. Amethyst examples are somewhat more available, with lavender and cobalt blue classified as rare. Only a handful of ice green examples are known, but rarely available. Peach Opalescent nappies are virtually unheard of. the difference between the two isn’t as great as we think. for God never commands us to do anything without supplying the strength. He pledges Himself to give you power to do it. Whenever there’s a command, whatever it is, He gives the strength to obey it. Whenever there’s a promise, whatever it is, He gives the faith to claim it. We’re to do all things for His glory, and we can do all things through Him who strengthens us.